One of the most amazing and wonderful things about Ecuador and the Galapagos Islands is the wildlife. The rich diversity of creatures to be found in the air, on land and in the sea is mind blowing. One of my favorite air critters is the Blue-Footed Booby (Piquero de Patas Azules). Blue-footed boobies are normally found on arid, tropical, and subtropical islands off the Pacific coast of South America (especially in the Galapagos Islands off Ecuador). Subsisting on a diet of fish, these large seabirds can live for around 17 years. They have a wingspan of nearly five feet in length. They weigh 1.5kg. The blue of the webbed feet comes from carotenoid pigments obtained from the diet. 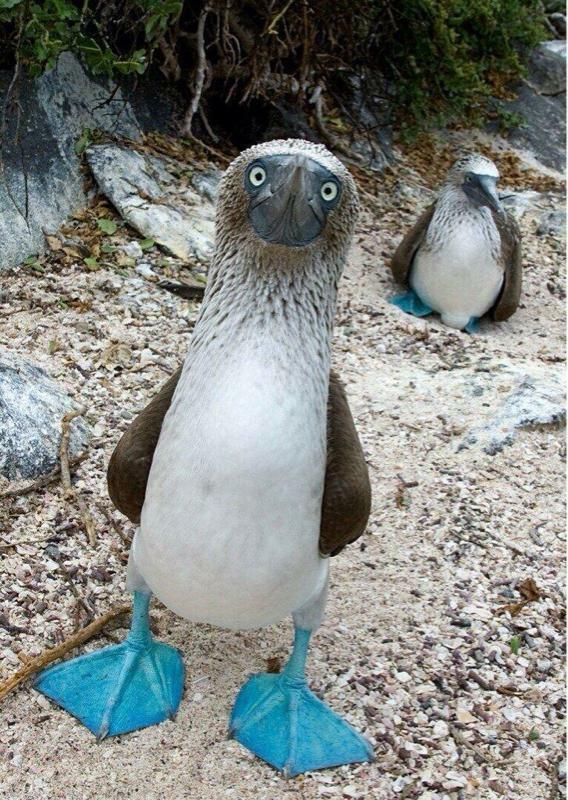 Blue-footed boobies use their vibrant blue feet in a showy mating dance ritual. Habitat loss and egg collecting currently threaten the species. Blue-footed boobies have a large, but little known, colony on Mompiche Point. The mating ritual of the Blue-Footed Booby is a spectacle to behold indeed. The synchronized movements of both birds and the male’s high-stepping strut to show off his blue feet to attract the female is comical and highly entertaining. The bluer the feet, the better. The smaller male birds kiss and peck and clack beaks and whistle, kicking up their feet to show the prospective partner how beautiful and fabulously blue they are. Flaunting his blue feet and spreading his wings, presenting his mate with building materials for the family home, ensures he won’t be left out in the cold. Blue-Footed Boobies also use their large webbed feet to protect their young and keep them warm. Eggs are laid in nests on the ground. After the brood of one to three chicks hatches, both parents feed and care for their babies. Breeding pairs usually only stay together for about one year then, unable to resist the urge to go dancing once again with their bright blue-suede shoes, they go off and find a different mate. Galapagos is home to about half of the world’s breeding pairs. Exceptional divers, Blue-Footed Boobies wrap their long wings around their streamlined bodies and plunge into the water like spears from as high as 80 feet (24 meters) to catch small fish. They also dive from sitting positions on the surface of the water. A large flock of diving boobies is an impressive sight as they circle and dive over large schools of anchovies and other small fish, popping up like corks to swallow the catch. People travel from all over the world to come and see Blue-Footed Boobies in Ecuador – especially visiting Galapagos to find flocks of Sula nebouxii, and observe their weird and wonderful mating ritual. They can also be found on Isla de la Plata, and here in Mompiche. Would you like to see a colony of Blue-Footed Boobies? Ask Footprints how. Footprints Ecuador helps you custom design and plan your trip to Ecuador, inc. Galapagos Cruises, Island Hopping, Scuba Diving, and also travel on the mainland inc. Otavalo, Cotopaxi, Mindo, Quito, Cuenca & more. See the Boobies in Ecuador! This entry was posted in Birds, Ecuador, Galapagos Cruise, Galapagos Islands, Travel, Wildlife and tagged Beach, blue feet, boobies, Ecuador, fishing, Galapagos, Galapagos Cruise, Galapagos Islands, Galapagos Tour, mating ritual, seabirds, Snorkeling, Tour, wildlife. Bookmark the permalink.